We develop, market and support a range of engineering analysis software products all based upon the LUSAS finite element analysis system. LUSAS software products can solve all types of linear and nonlinear stress, dynamics, composite and thermal engineering analysis problem, across a range of engineering industries. LUSAS consultancy services solve a wide range of analysis problems for clients in all engineering industries. For bridge analysis, design and assessment. For civil, structural, nuclear, seismic, geotechnical and offshore engineering design and analysis. For analysis and design of composite products or components. For academic teaching, training and research use. For automotive, aerospace, defence, manufacturing and general engineering analysis and design. LUSAS software options extend the analysis capabilities of particular software products. LUSAS case studies show illustrative uses of LUSAS software on projects around the world. LUSAS video and webinar presentation sessions show particular aspects of software products in action. 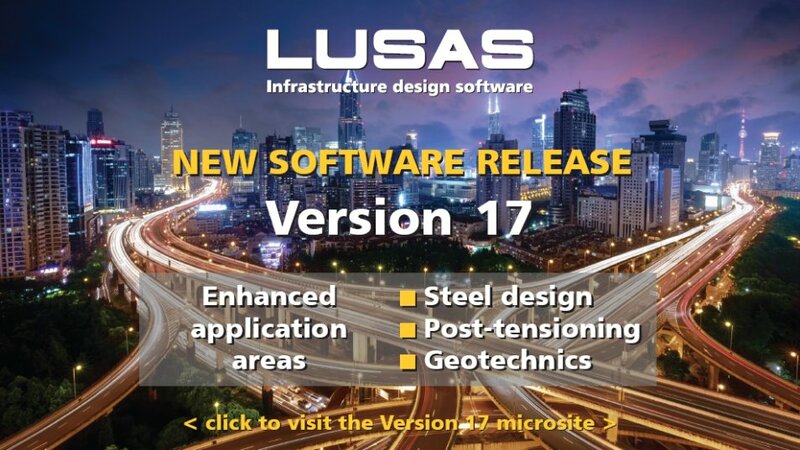 LUSAS version 17 microsite contains details of the current release. Version 17.0 sees steel frame design checking and vehicle load optimisation capabilities extended, prestress enhancements, additional creep and shrinkage models, and new facilities for soil-structure interaction modelling. New viewing and editing features simplify the management and changing of attribute assignments, improving general ease-of-use. An overview of the design, post-tensioning and selected ease of use features in version 17 with presentations covering: steel bridge design checks to EN1993-2: 2006; defining and assigning of tendon loading attributes to selected features in a box girder bridge modelled using shell elements; and improved attribute assignment viewing and editing facilities. See LUSAS video presentation sessions for software presentations. See LUSAS Webinar recordings for full-length recordings of other webinars. Detailed modelling of a single span half-through steel girder railway underbridge with a 50 degree skew to reduce number of deck bearings used and assist with checks to specific design codes. 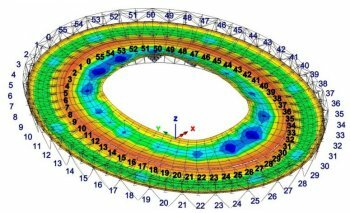 Independent modelling and checking of the various stages involved in the deconstruction of the original cable net roof of the London Olympic Stadium and subsequent construction of a new long-span replacement for what is now called the London Stadium. LUSAS is exhibiting at International Bridge Conference (IBC 2019), National Harbour, MD, USA, 10-13 June 2019. LUSAS is attending AASHTO 2019 Committee on Bridges and Structures Meeting, Montgomery, Alabama, USA, 24-29 June 2019. LUSAS is attending the Concrete Bridge Development Group Annual Conference 2019, London, 26 June 2019. See News and Events for details of all forthcoming conferences and events of interest. 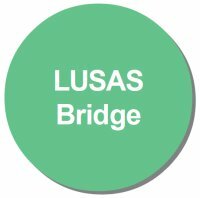 LUSAS for Structural and Bridge Applications Kingston upon Thames, UK, 14-16 May 2019. 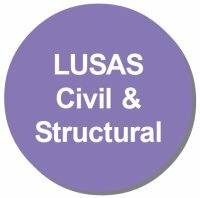 LUSAS for Structural and Bridge Applications Glenrothes, Scotland, UK, 14-16 May 2019. LUSAS Dynamic Analysis Kingston upon Thames, UK, 3-4 June 2019. 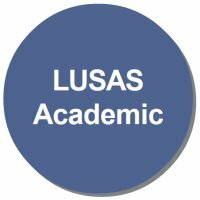 LUSAS Nonlinear Analysis Kingston upon Thames, UK, 5-7 June 2019. See our Training page for details of all training courses. Account Managers | Reviewed 26 March 2019. Account managers sought to further strengthen our position as a leading global supplier of advanced infrastructure analysis and design software. More details. Engineering Consultant | Reviewed 26 March 2019. We require a bridge or civil/structural design engineer to expand our technical services team based in the UK. More details. Software Engineers (Structural Design) | Reviewed 26 March 2019. We require experienced Bridge and Civil/Structural design engineers to expand our structural design development team based in the UK. More details. C++ Software Engineers | Reviewed 26 March 2019. We are always looking for Software Engineers to join our LUSAS user interface development team based in Kingston upon Thames. More details. Our occasional email newsletter 'LUSAS e-News' supplies users and other subscribers with details of new LUSAS software releases, forthcoming LUSAS events such as webinars and training courses, and of any significant changes to the LUSAS website that may be of interest. You can subscribe here. Any modelling and analysis capabilities described on this page are dependent upon the LUSAS software product and version in use. Last modified: April 12, 2019 .